Throughout the 2016 presidential race, the Donald Trump and Hillary Clinton campaigns have decried the news media for treating them too harshly. Americans, however, don’t seem to agree. Only a slim minority thinks the news media’s coverage of Trump and Clinton is too tough, a view the public also held in previous general elections. In fact, more Americans say the media are too easy on Trump than said so of the Republican nominees in both 2012 and 2008. As for Clinton, views of whether she is being treated too easily tend to be more similar to recent election cycles. Almost three-in-ten Americans (27%) feel that Trump is treated too easily by the media, according to a Pew Research Center survey of 1,000 adults conducted Sept. 15-18, 2016. That’s more than said so of Mitt Romney in 2012 (20%), and nearly twice the share who said so of John McCain in 2008 (15%). A third (33%) also say this of Clinton, slightly more than felt the media were too easy on Barack Obama in 2012 (28%) but about in line with views of his treatment in 2008 (31%). On the flip side, the public’s sense of whether the news media are being too tough on Trump is not different from Republican candidates in recent election cycles. Nearly the same portion of Americans think the press is too tough on him (23%) as felt the same about Romney in 2012 and McCain in 2008 (21% and 23%, respectively). For Clinton, just 16% of Americans say the media have been too tough on her, which is on par with views in 2012 about how tough they were on Obama (15%). But more see coverage of Clinton as too tough than did so of Obama in 2008 (7%). The greater sense that Trump is being treated too easily by the press compared with previous Republican nominees largely comes from Democrats. About four-in-ten Democrats and Democratic-leaning independents (43%) perceive the media coverage as too easy on him, nearly twice the share who said the same of McCain in 2008 (22%) and 16 percentage points higher than said this about Romney’s coverage in 2012. When it comes to their own candidate, Democrats and Democratic-leaning independents are much more likely to say that coverage of Clinton is too tough (30%) than the 10% who said that of Obama’s first run for the presidency in 2008. But there is little difference from his re-election bid, when the share who thought coverage was too tough rose to 24%. Just 16% of Democrats and Democratic leaners believe Clinton is being treated too easily, somewhat higher than the portion who said the same of Obama in both of his elections. While Democrats’ criticism of coverage has increased from previous years, Republicans have been rather steady in how they feel the media cover the candidates. 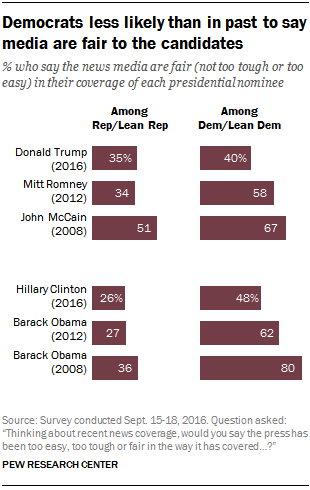 For instance, nearly the same share of Republicans say coverage of Clinton is too easy as said this of Obama in both 2012 and 2008: About six-in-ten Republicans and Republican-leaning independents have said this of the Democratic nominee in the fall of each of the three elections. Meanwhile, fewer Democrats say the news media are treating either candidate fairly than in past years. While eight-in-ten Democrats and Democratic leaners said the news media were fair in their coverage of Obama in 2008, this figure dropped to 62% in 2012, and is now about half (48%) for Clinton. Similarly, their share for the Republican candidate fell from 67% in 2008 to 40% this year. Note: Read the full methodology and topline results here (PDF). Jeffrey Gottfried is a senior researcher focusing on journalism research at Pew Research Center.